Each room in the house has its purpose, and that purpose is not to be a home to clutter. Let's investigate some ways you can make or repurpose your storage solutions to clear the clutter and look great too. Room by room, here we come clutter. Be afraid, be very afraid! A hallway is usually either a wasted space, or crammed full of junk - there is a happy medium. 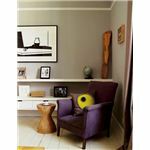 This area of the house is one of the best for fitting in storage, whilst still looking unobtrusive. 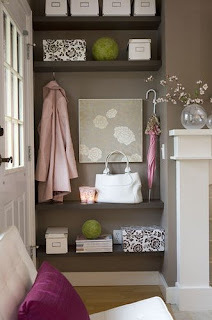 Whatever size of hallway you have, storage that fits closely to the wall with plenty of nooks for shoes, umbrellas, and knick-knacks, is easy to fit in. If you can't find one like the one pictured, then try buying plain wooden boxes, and attach them together with a strong bonding solution (No More Nails, for example). You then have complete control over the size and formation of the boxes. 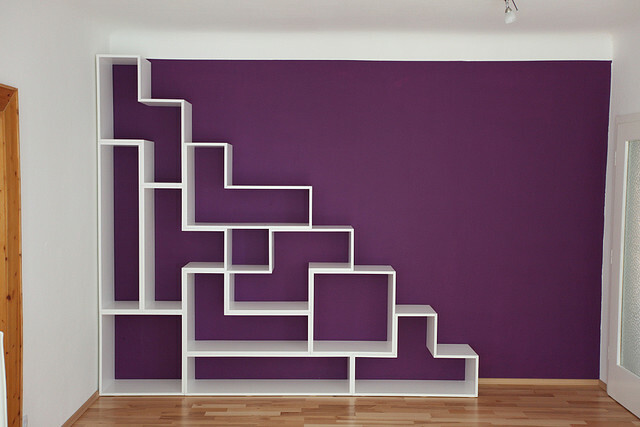 This can then be painted to coordinate with your hallway's color scheme. For those of us with even more limited space, a quick and easy DIY storage solution is to buy small baskets, make a loop out of rope, cord, or ribbon, and attach it to the basket to be hung on small hooks on the wall - try giving each member of the family their own personalized basket, to keep small items in their place. Living rooms need to be cozy and inviting, instead of cluttered, so the real key here is organization. Buying products that have a dual purpose is a great way of incorporating storage, without anyone realizing it's there. 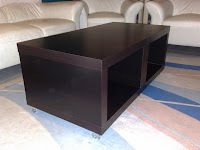 Footstools that lift up, to reveal a storage box underneath, a TV stand that has plenty of cupboard and drawer space is a must for keeping DVDs and games tidy, you can even buy coffee tables that have built-in drawers or a lift-off top. For household storage solutions that put everything out on display, you really need to take advantage of any alcoves and nooks in your living room - perfect if you have an odd shaped great room. Shelving can be pushed back into the alcove to put candles, vases, and books out on display, or you can use them to store pretty boxes, that keep other items hidden away. A simple DIY job is to make two storage solutions out of one - fit hooks, small shelves, or rails to the inside of cabinets. Use the tops of units to store items that you don't use very often. Decide what could live elsewhere - the utility room and garage could house washing solutions, and recycling bags for example. 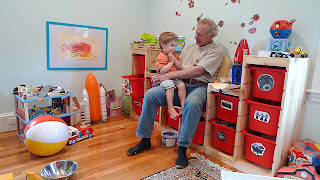 OK, so the playroom is never going to be a room that is kept tidy, but it does minimize accidents, and let's your little ones find things easier, if there is a place for everything (even if it doesn't stay there long). It depends on your playroom decoration and theme, to a certain extent but using items that are dual purpose is definitely a good technique to use. Wall-mounted shelves, that are affixed high on the wall, give the room more of a feeling of space, as well as keeping items out of a child's reach. If you don't have a divan bed (a bed with built in drawers), then consider investing in storage boxes on castors that can slide underneath the bed. Fabric storage boxes, painted wooden boxes, or attractive hat boxes are all household storage solutions, that look good as well as performing a function. If you don't have built-in wardrobes make use of the room on top of them to store the boxes. Consider making a headboard, that doubles up as a storage space too. All you need is to pull the bed away from the wall, and consider how much space you can utilize behind it. Using this is a starting point, a simple open-ended box can be made out of ply-wood. Either add a small hinged door, leave it open at the top for easy access, or cover it with a coordinating fabric - A DIY storage solution created with ease. Low-level shelving is another easy DIY job to fit, that is more in keeping with the feel of a bedroom, and can even double up as a bedside table. Hide away items like towels, and children's toys, unless you present them nicely on open shelving as a finishing touch. Look for bath units that have hidden storage within them - modern designs have an extra section at the end of the bath for lift up, or pull out storage. Installing a faux wall in an odd shaped bathroom, makes it feel more logical and ordered, whilst still giving space for storage, behind the wall. Whatever your storage dilemma, in whichever room of the house, there is a DIY household storage solution for you.